To me, Odinism is the modern expression of the Germanic Folk Soul. It is a manifestation of the Teutonic folkish personality, a personality that seeks a balanced relationship with humankind and its Mother Jorth, a holistic connection between itself and the higher and lower spirits, and an earthly system of verities and ethics. This folkish personality also embraces the evolving multiverse as it is (coming with both opportunities and challenges) and does not dread nor await an end (by any definition) of this divine reality. Odinism is not a religion in the usual sense of the term – that is to say, it is not a static canon of beliefs or a set of ‘divine’ and inalienable proscriptions by which an institution or religious hierarchy can control the conduct of its subjects. Practitioners of the Odinist Faith consult the patterns of nature and use common sense for their moral compass and generally reject the notion of a body of persons meting out ‘holy’ do’s and don’ts in accordance with the dogma of their church. In practice, the folk of Odinism venerate reason and virtue and integrity of community. They look to the past for examples by which to model the future, acknowledging the deeds and sacrifices of their forebears – good and bad, great and small – and they use this wisdom to design a social strategy for the advantage of posterity. The Gods and Goddesses – those beings within and without, above and below, before and after creation, and so little understood if eminently described – which are defined broadly in time-wrought tales and rendered uniquely in the heart of each of the folk, are forces respected by Odinists and recognised for their roles in the crafting of space and matter, and of living creatures, and for the very conveyance of soul and spark. The divine races, known mostly by intuition, are loved and honoured and given a central place within the beliefs and rituals of Odinists. The Odinist folk proudly bear the power of creation and destruction, alongside their divine kin, who gave it to them, though never do the folk, who observe examples of courage, candour and liberty in their myths, assume a place subservient to that of their deities. This is because humankind and that-which-is-holy are equal and unified in the unending mission of interesting physical and spiritual development. 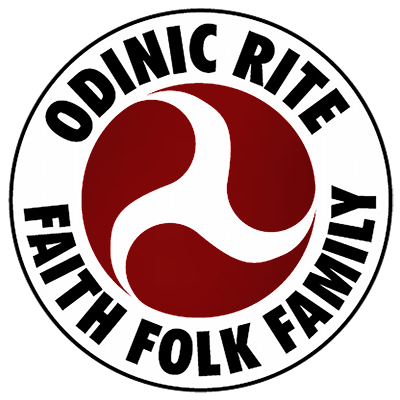 Individually, The Odinist practitioner can freely choose his or her method of personal enrichment and spiritual learning, so long as this choice comports with the laws of survival laid down by nature itself, lest the Norns of selection pluck from creation that person or the family line of that person. Collectively, the Odinist community preserves the time refined symbols and customs generated by the harsh elements and resilient Nations of Northern Europe. Within the symbols and customs of the North is provided an external body of rites and culture with which individuals can identify and find their ancestral mind and spirit – Home. What is Odinism to me?